It's been a crazy week here at the Anvil of Crom offices. Ok, I'm not really important enough to merit my own office, unless you count the spare bedroom with a computer and dozens of discarded MMORPG boxes spiraling towards the ceiling. Nonetheless, much Age of Conan playing, researching, and writing has gone on as of late. In addition to my characters on the live servers, I've been exploring the lands of Khitai thanks to the gracious folks at Funcom who have allowed me to take a peek at the Rise of the Godslayer beta. I'll be detailing my experiences with the expansion for you in the next couple of days, so keep your eyes peeled. I've also managed to find time to advance my rangers a bit, and have played through the entirety of Conall's Valley with the exception of a couple of pesky group quests. At this point, approaching level 40 and having a decent feel for combat, feats, and the game in general, I feel safe in declaring myself a former newb. Certainly it's a big jump to 80 from where I'm standing, but after spending a few days exploring the Cimmerian highlands, it's clear that I made the right choice in returning to Funcom's Hyboria. Hit the jump for some impressions of Conall's Valley. Young Cimmerians fresh off the boat from Tortage will find themselves in Conarch village, an archetypal frontier settlement nestled among the foothills of the Eiglophian Mountains and home to King Conan's ancestral clan. From this central hub, the various Cimmerian play fields are accessible, including Ymir's Pass, the Eiglophians, the Field of the Dead, and Conall's Valley. This last one, a gaping wound in the Earth featuring treacherous ridges and rivers running red with blood from the invading Vanir, is where I spent the vast majority of my post-20 play time. While many of the leveling guides available for Age of Conan will tell you to skip Conall's Valley and head for Knopshef Province after leaving Tortage, it says here that players are better off running to the Cimmerian hills, particularly if you've rolled a Cimmerian avatar and have the slightest affinity for the underlying Robert E. Howard lore. The Valley is a war-torn visual tour-de-force, with gruesome corpses littering the pathways and bloodthirsty Vanir raiders lurking in every beautiful glade. The ravine sits in the shadow of Ben Morgh, the mountain seat of Crom, and serves as something of a griefer's gauntlet on Age of Conan's PvP servers. PvE is no less intense, at least until you climb above level 30, as there are large packs of aggro mobs looking to make mince meat of your fresh-faced Tortage graduate. As you make your way north through the expansive zone, the greenery gives way to the snow-capped beginnings of the Eiglophian range where Ymirish marauders have set up a forest of tents, camps, and fire pits that make for some of the more engaging visuals I've experienced in the massive genre. The Valley is a war-torn visual tour-de-force, with gruesome corpses littering the pathways and bloodthirsty Vanir raiders lurking in every beautiful glade. Quests are plentiful in Conall's Valley, and the majority of them are solo affairs. You'll run interference for the competing Cimmerian tribal leaders, sack various enemy encampments, and even assassinate Vanir wounded over a variety of missions that feature above average story lines and further the general ambiance of the zone. Sadly, the high quality voice-overs from Tortage are missing in action, but the writing remains top notch and the story will likely immerse those who take the time to read. 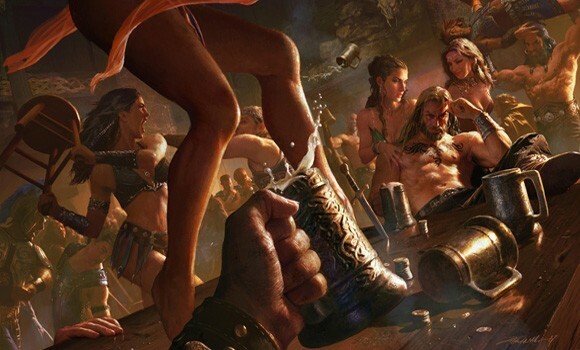 Grouping aficionados aren't forgotten entirely, as the aforementioned Ymir camps require a decent sized party, but the majority of the zone's content can be experienced alone. As a result, the valley occasionally feels a bit isolated despite its impressive size. If there's a downside to Conall's Valley it's that you'll often see players flitting to and fro but you'll have no real need to interact unless you fancy roleplay or are a quest completionist. I grouped a grand total of three times during my week in the valley, and on each occasion it was a transitory experience reminiscent of the worst PUGs: people dropping in and out, folks unsure of their class roles, and a pervasive "I'm done with my quest so see ya" attitude. The other downside, if you're a min/max type, is that the valley does feature a lot of running around (which is likely why most guides tell you to avoid it). Due to the mountain paths and the varied NPC locations, you'll spend a fair amount of time traveling about and it's probably more efficient to level in a smaller, more densely packed zone. That said, it's more about the journey for me, and Conall's Valley storylines and terrain more than made up for any extra time I spent in transit. Conall's Valley is also where I started to feel the true power of the ranger class, at least in terms of PvE (PvP is still largely an exercise in getting the jump on the opposing player). My PvE character uses crossbows almost exclusively at this point, and it's a rare occasion that Armor Ripper and Piercing Shot doesn't kill a single target outright. I've also spent feat points to increase the column width of several attacks, and, provided I take the time to position the mobs correctly (via terrain, snares, or both), my ranger does pretty well against three or four mobs of equal or slightly higher level. At some point I'd like to try the melee weapons but there just hasn't been a need as targets very rarely close the distance. I'll examine combat in much more detail in a future column, but for now, it's back to Khitai for your humble columnist. That's all the time I've got for this week. Check in with Massively early next week for my Rise of the Godslayer beta impressions, and also feel free to email me (jef AT massively DOT com) with your Age of Conan questions. I'll collect the most pertinent for a future column, as well as pass the best ones on to our friends at Funcom. 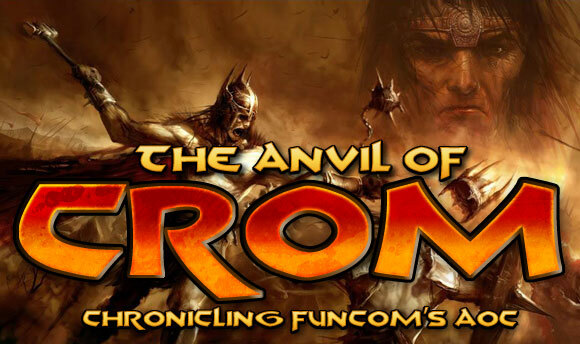 Finally, thanks to munglejunkie for the updated Anvil of Crom banner graphic. Until next time, I leave you with the requisite bar brawl.